The fourth season of popular Netflix show, 'Narcos' is coming out on November 16. Titled 'Narcos: Mexico', Diego Luna and Michael Pena are the show's antagonist and protagonist respectively. 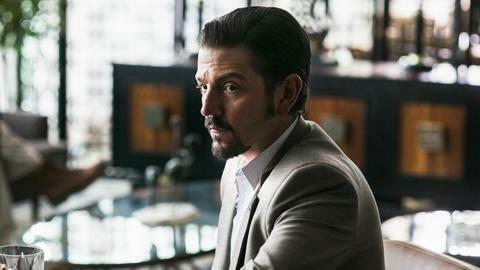 Luna plays infamous cartel boss Felix Gallardo while Pena plays Agent Kiki Camarena. At Netflix's event in Singapore, the stars opened up about the upcoming season. Read on to know what they said. First off, what is the upcoming season about? Season 4 will focus on the formation of the Guadalajara Cartel. To recall, Season 1 and 2 showed Pablo Escobar and the Medellin Cartel and Season 3 focused on the Cali Cartel. This season, based in Mexico, will show how the cartels were formed and their entry into the cocaine business. Executive producer, Eric Newman believes Season 4 provides the context of previous seasons. What did Diego Luna say about the season? Luna hoped the new season would shine a brighter light on the drug problem in Mexico. However, he decided not to contact any of the imprisoned cartel members for background research into the character. Interestingly, Felix, the drug lord he portrays, is alive and in jail. Instead, he chose to base his research on books and documentaries believing there are 'no good or bad characters'. Luna said, "He knew how to hide. He had a real necessity of belonging to a community. He owned restaurants and bars and a hotel. There was enough for me to try to understand this guy. I researched the Mexico he was living in". What did Pena say about the upcoming season? Pena spoke of the season from Camarena's perspective, wondering whether he wanted justice or to take down the big bad boss. He said that the people in the DEA viewed Agent Camarena as a Christ-like figure, for the ultimate sacrifice he made. Notably, Camarena was tortured and killed by Felix which spurred a massive DEA murder investigation that ultimately brought down the cartel boss. The first 2 seasons were successful because Wagner Moura brought Escobar to life. In order to portray the character accurately, Luna has to justify the traits of a person who is convicted. He does so by reminding himself how Felix gave back to the community and how Mexico pays homage to slain drug lords. Combined with Pena's perspective, the new season seems promising.